West Virginia | I JUST WANT 2 RIDE!! While I don’t think West Virginia does enough to promote motorcycle tourism things are getting better! Four eastern West Virginia counties have joined forces to create a new push called RIDE THE HIGH FIVE. I have not traveled each of the roads listed but I have been on few plus many others in the area (check out our ROUTE 39 ride from last year). The RIDE THE HIGH FIVE web site include GPS routes and a lot of additional information, check it out. A while back I wrote a post on the “Decline of the motorcycle”. 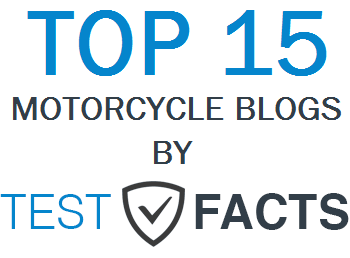 BUT here is a article that talks about the “Most popular motorcycles among MILLENNIALS!” I have to say I was on a little surprised. Some of the funniest motorcycle commercials! Watch how not to catch a runaway motorcycle! How about a 360 degree view of a record setting speed run up Pikes Peak on a KTM 790 Duke motorcycle! Twisting and turning through the West Virginia panhandle counties of Jefferson, Berkley and Morgan the Washington Heritage Trail is a lot of fun on a motorcycle. Riding through an area that George Washington surveyed, fought for during the French and Indian war and represented as part of the Virginia House of Burgesses was very interesting. Leaving the house about 9AM we decided to stop for breakfast at McDonalds in Bunswick, MD. The McDonalds is just off a roundabout and, as you know, traffic coming into the roundabout must yield to traffic in the circle. Well as most of us in this part of the world knows, traffic rules do not apply to operators of Maryland automobiles. A gray haired lady nearly took us out by not yielding the right of way. Luckily, being aware of the fact that the rules of the road do not pertain to Maryland drivers, I was paying close attention and was able to turn tight against the inner curb allowing for a near miss. This was not our only run in with a Maryland driver that day. After breakfast we headed out and, after crossing the Potomac and Shenandoah, were quickly riding our motorcycle on the Washington Heritage Trail. There are a lot of places to stop and take in the history and culture of life in the West Virginia panhandle but for us this day was about riding the motorcycle. 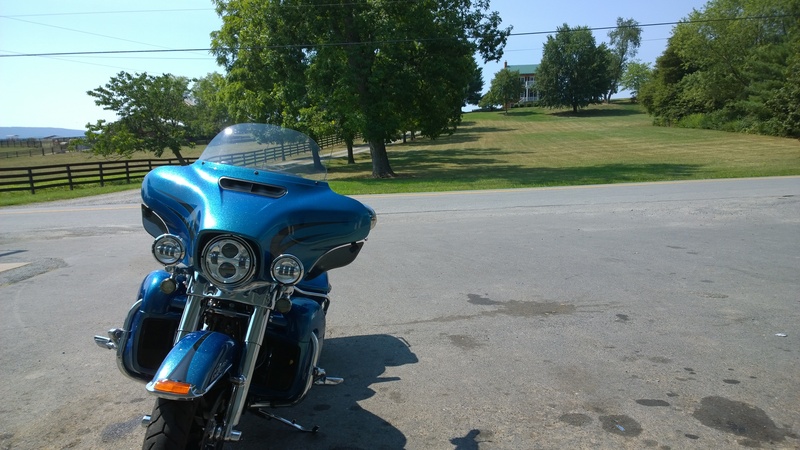 Riding our Daytona Blue Harley Davidson through the towns of Harpers Ferry, Shepardstown and Martinsburg was a ride through the rolling hills and country roads of the Shenandoah Valley. Bucolic county side, cattle in the fields and sadly decaying main streets made for a visually stunning ride. Our motorcycle tour of the Washington Heritage Trail started into the Appalachian Mountains shortly after passing through Martinsburg on WV Route 9. Steep accents and deep valley roads brought us to the little town of Berkeley Springs. This town was once the regions greatest tourist destination due to its famous springs and “baths”. Lots of little shops dot this downtown and you can spend an entire day just wondering around town. But, as I mentioned earlier, we were about motorcycle touring today, hanging a left we headed out of town on Valley Road. It was not long before we turned east off of Valley Road and onto Big Oak Tree/Shanghai Road. This would be a great road for motorcycle riding or touring if it were in better condition. I am only guessing but, I would think that the elevation from Valley Road to the top of the mountain had to be over 1000 feet. Some of the 160 degree (or more) switch backs had you gain or lose dozens of feet of elevation in a single turn. Sadly the road is poor shape, the patching of patches on top of other patches to the tarmac make for a rough and tumble ride. It is worth it in my opinion but take it under advisement. Coming down the other side of that mountain leads you into the town of Shanghai, WV. A four way stop intersection and a blink and you have rolled past. Climbing and deciding another mountain and we were back into the Shenandoah and heading towards the 136 mile marker and the end of the Washington Heritage Trail. All in all, our motorcycle tour of the Washington Heritage Trail took about 3 hours. If one were to stop and enjoy the towns, parks and points of interests this ride could take all day, there is that much stuff to check out. The Washington Heritage Trail is just one of the many roads comprising the amazing American Byways. If you have not checked out the website please do, you just might find an amazing road in your area. We started our motorcycle vacation today. We left the house about 8AM and headed out to Ohio on our Harley Davidson Ultra Limited. Our, path for all but a few miles on day one, is via US Route 50. We picked up Route 50 just a few miles south of Leesburg, VA. I have to say that Route 50 from this point to our endpoint is a fantastic motorcycle ride. In Virginia you ride through horse and wine county (I quite counting vineyards and wineries at 15). In fact in Middleburg we saw folks preparing their horses for a jumping contest (I am sure there is a proper name for this contest, but I do not know what it is) there were dozens of horses and riders milling about. My wife said she thought it was called “Trials”, to which I replied then they are all guilty! Shortly after crossing into WV you head into the Appalachian Mountains. These mountain roads are some twisty fun for a motorcycle! Swooping around turns, quick climbs and steep descents (up to a 9% grade) with spectacular views from the mountain tops and rolling farmland in the valleys make this a route, in my opinion, as much fun as any of the roads around the Tail of the Dragon. By the way I dragged the floorboards of the bike a few times without even trying! I had forgotten that Route 50 passed into Maryland for a few miles so today we traveled in 4 states. When we left Maryland and rode the motorcycle back into WV Route 50 also became the Northwestern Turnpike one of America’s Byways. Stopping for lunch and gas in the little town of Grafton, WV we ate a McDonalds, which had to be one of the least clean stores we had been in…unfortunately I did not notice this until after we had received our food. We did make a side trip to Cairo … I am still taking my wife to all the great cities of the old world, via motorcycle. I was able to get her to Lisbon and Damascus last year. Athens is next on the list! The first day of our vacation motorcycle trip is now over. 315 miles through some of the best country for motorcycle riding. I highly recommend this part of Route 50 to anyone passing through WV, MD or VA. OHHH… for got to mention, that per Standard Operating Procedure, we got wet in a thunderstorm!!! Storm Chaser powers ACTIVATE! My motorcycle ride to Shanghai…or HOW in the heck do you lose one glove?? The view of the Shanghai skyline. I have always been interested in going to Shanghai but a trip to China is not in my future. So a motorcycle ride to Shanghai West Virginia would have to do. Leaving the house the early cool air hid the fact that it was going to be hot, the mid 90sF according to the weatherman. I headed west toward Martinsburg, WV where I stopped for a quick breakfast. SOMEWHERE between getting off the bike and getting back on the bike I lost a glove. I back tracked into the restaurant and searched all the places I had walked and sat and then back out to the bike but, NO GLOVE…what the heck?!?! There was only so many place the glove could be and it was nowhere to be found. Dang. This made no sense, how do I lose one glove! Giving up on ever finding my glove in the Bermuda Parking Lot of missing gloves, I rode out of Martinsburg on US Route 9 looking for WV Route 7. Somehow I missed the turn onto Route 7, maybe it was the awesome rolling road and wonderful scenic vistas. But no worries…….it is the journey not the destination, right? Route 9 took me into Berkley Springs, WV were I turned onto several different roads ending up on WV 13 which was also Shanghai Road. Shanghai Road climbs up the and over the steep mountainside with a lotof switchbacks. If the pavement had been in better condition this would have been an INCREABLE ride. Shanghai Road has MULTIPLE 150-170 degree turns with serious elevation changes, both up and down the mountain, and almost no traffic! The tarmac on Shanghai Road was so poor that that a good bit of fun was sucked out of the ride, some but not all. A better conditioned road and this would be a sport bike heaven. Dropping down the other side of the mountain you end up at the cross roads of Black Creek Valley Road and Tuscarora Pike which is also SHANGHAI, WV. Not too much in Shanghai other than a small scrap yard, a Mom and Pop country store and farms. I stopped at the store for some water and a snack. Back on the road I rolled back through Martinsburg and on to home. A couple notes of interest. First is, part of this ride was on the George Washington Heritage Trail (an American Byway) and second I went past the Morgan County Observatory. The Observatory was closed but it looked very cool way out in the middle of nowhere. There is not a lot of pictures from this ride as my wife/photographer was out of town. After this 175 mile ride I can now claim I have been to Shanghai….. Shanghai, West Virginia. Morgan County Observatory (from their website). Last Sunday morning Debbie and I jumped on the Ultra Limited (I think I am going to call it Big Blue) for a day ride. With no real destination in mind we thought about hitting a couple spots on the C&O Canal. If you have been following this blog you know I am slowly documenting those spots along the canal assessable by motorcycle. We left the house about 9AM heading west. 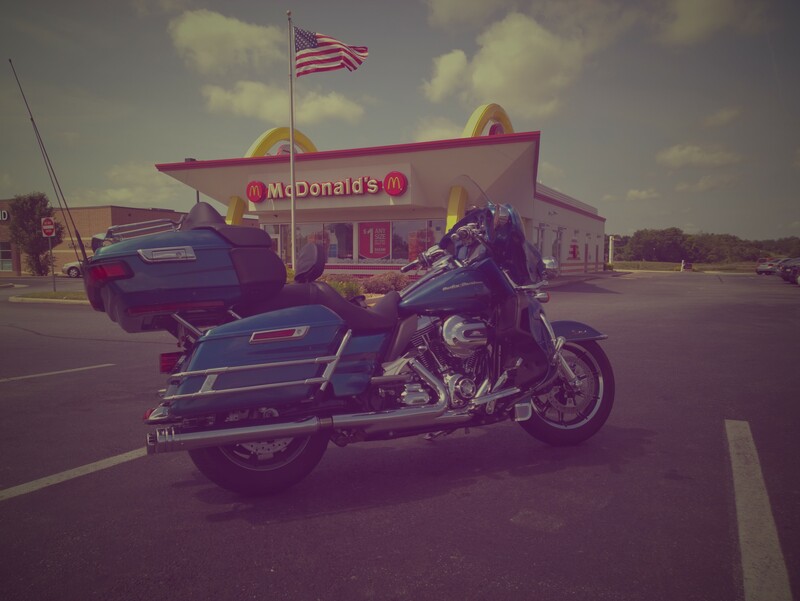 We stopped for a bit of breakfast at a McDonalds along Route 9 near Charles Town, WV. As you can see in the photo it is one of those restaurants designed to look like an old school McDonalds, pretty cool. After filling out tanks (including Big Blue’s) we continued west on WV Route 9 then north on Interstate 81 then west on Interstate 70. Normally we like the back roads much more than the Interstate but today we thought it would be better on the highway. Pulling off into Hancock, Md we begin looking for the stops on the Canal but also found some other cool things as well, like the huge anti-aircraft missile in front of a Veterans of Foreign War (VFW) building. We found both stops along the C&O, the Tonoloway stop and the Hancock Visitors Center. The visitor’s center was very hard to find as it is not well signed and the road into the park was practically invisible unless you are looking for it as we were. Heading back east we wanted to stop at one additional canal stop (4 Locks) and we did but not the one we were looking for. Again the signage was bad and we happened upon C&O Canal Dam #5 only because I noticed a street called Dam #5 Road (quite imaginative) and the fact that I knew there was a C&O dam in the general area. But the fact we did not find the area we were looking for was no big deal as the area was great riding, rolling hills, great farmland views all made up for not finding the site. After looking about Dam #5 we mounted up and headed for home. On the way home we started seeing hundreds of motorcycles heading north and west along our route. When we stopped for lunch we asked a couple who were riding if they know what was occurring. Turns out it was the aftermath of “Operation God Bless America” a ride from New Castle, PA to the Veterans Hospital in Martinsburg, WV. 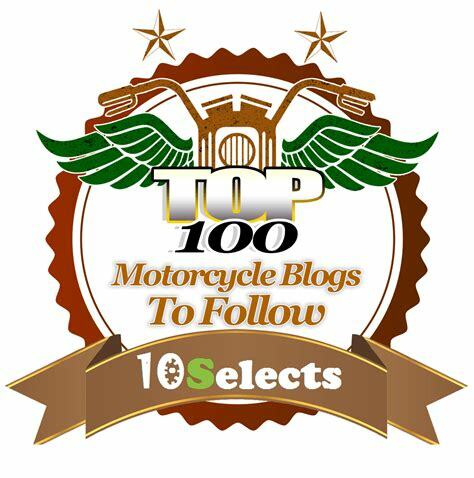 We have never heard of this particular ride before but with, according to the couple to which we spoke, over 2000 bikes it is one we will check out in the future. Unfortunately we had to head home to some yard work. But, as you can tell by the pictures, we had a good time on our 200+ mile day trip. I would rather ride the bike! 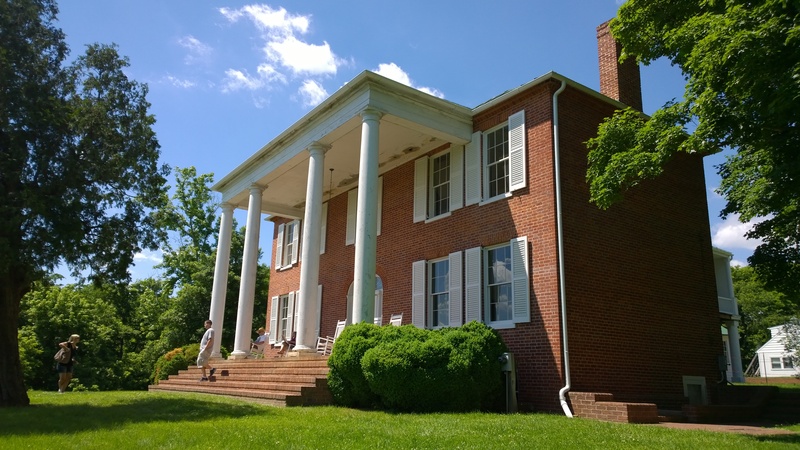 Historical Comments – Just up the street from Lock 38 is the Ferry Hill Plantation. The area around the plantation began as a cross river ferry site in the 1760’s. The ferry and plantation remained in a single family’s hands until 1958, a really good run. It site served as a restaurant and bar until 1974, catering to the students from Shepherd College across the river in Shepherdstown, WV. The plantation served as the headquarters of the C&O Canal National Park system from 1979 to 2001. Now it is a museum to the C&O Canal and plantation life in Maryland. If you are touring the Canal this is a nice side stop. Ride to Site – At the intersection of Route 34 and Canal Road, the ride to the plantation is a smooth easy ride. Coming from Canal Road be aware of the traffic on Route 34 as the speed limit does not seem enforced. Main Attraction – Ferry Hill Plantation. My Thoughts – One of the hidden gems while motorcycle touring the canal (it happens to be air conditioned) 🙂 . The plantation house is manned my volunteer docents who provide an oral rendition of the history of the home and grounds. This comes from many interweb sources…. Couple of things I caught… only 2 fires cause an investigation (but they have had combustion issues in the past)…. Cam-AM sold 52,000 Spyders!!!….. and there is a police version! 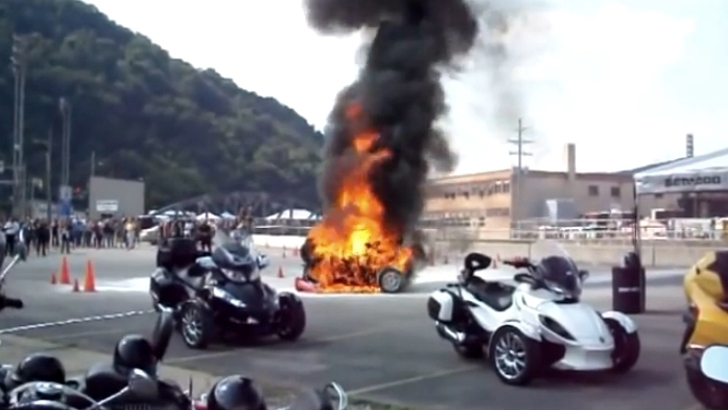 The Morgantown police, in a July 23 complaint to NHTSA, said an officer was riding the Spyder on a city street and felt heat rising from beneath the motorcycle. The officer saw flames coming from the engine and moved it to the side of the road. “Within seconds the vehicle was fully engulfed and flames caught a yard and two nearby trees on fire,” the complaint said. The Fire Department and a city mechanic determined that the fuel system was the source of the blaze, the complaint said. The three recalls happened in 2012 and 2013, and all involved the risk of fires. Last year, the company recalled about 8,200 Spyders because brake fluid leaks could cause fires. In 2012 it recalled about 34,000 because fuel vapors could leak due to an ill-fitting gas cap. It also recalled 9,600 because fuel vapors could exit a vent hose in the engine compartment. Motorcycle Ride: Pro Football, Harley Davidson GPS and 889.3 miles of highway! Over the 4th of July holiday weekend Debbie and I took a long motorcycle ride, 889.3 miles to be exact. 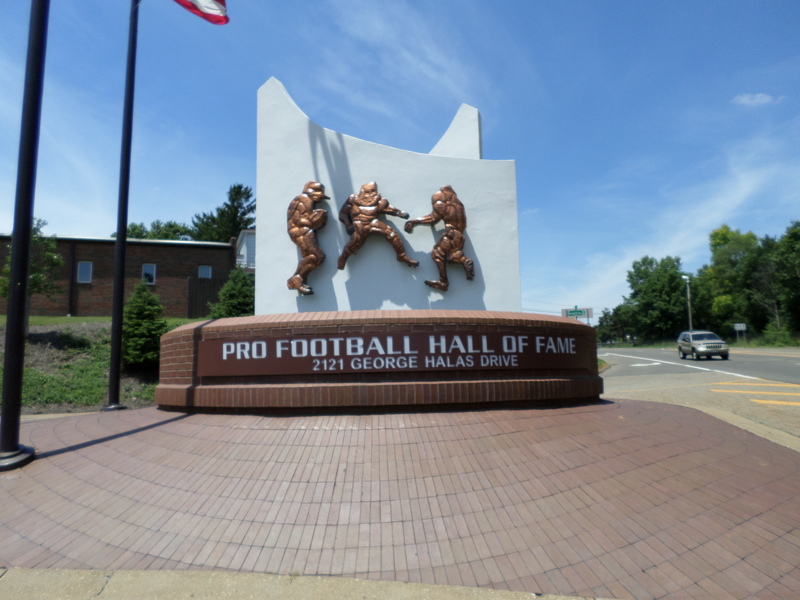 We rode out to Canton, OH and the Pro Football Hall of Fame (HoF). That would be the HoF for American style football, not the World Cup/FIFA type of football. We left the house about 9 AM on Friday morning heading west on I70, traffic was heavy but moving well. By the time we were on I68 traffic was very light but the police presence was heavy. For a while it seemed we saw a police cruiser every 15-20 miles. Even with all the cops, traffic moved at a nice 70-80 miles an hour! Not being in any real hurry we stopped whenever we needed or when Debbie had to stretch her legs. I also collect Harley Davidson dealer pins and have all but two for the shops in West Virginia, Bluefield and Wheeling. This ride would have netted me the Valley HD, (Wheeling) pin but they were closed for the 4th. Moving on, we arrived at our hotel, the North Canton Courtyard, about 4PM. We were tired from the long day in the sun so we had a small meal in the hotel bar and “retired” to the room and it’s whirlpool tub. The next morning we rolled out to the HoF. We had a really good time, reviewing all the displays. The history of professional game was quite interesting, if you every get a chance to check out the uniforms of the Duluth Eskimo’s it will be at the HoF! The one thing I was surprised about was how small the HoF was, with over 100 years of history I expected more content. Also, I thought that some of the displays were not set up in a manner to ensure that they are going to last another 100 years. I hope that the HoF is taking preservation more seriously then it appeared. It took about 4 hours to make it through all the exhibits of the hall. After lunch we decided to go to a couple of the local HD dealerships. It was here that a VERY surprising weakness with the built in GPS appeared. I selected Freedom HD from the list of local dealerships in the GPS and we rolled out. After about a 15 minute ride the GPS announced that we had reach our destination “on the right”. “Technically” it was correct, Freedom HD was on the right, but we were in the middle of the interstate and the dealership was about 300 yards, a large ditch, a fence and another road away. It was no better when we attempted to go to Adventure HD. You could see the dealership as we traveled down the interstate but, the GPS lady directed us in the opposite direction when we hit the exit. Following her directions we ended up in the parking lot of a Sheetz gas station. Not only did it fail to find these two dealerships, it also failed to find Steel City HD on our trip home, placing the shop about a mile away on the wrong side of the road. We only found this store because there was no place to turn around along the road. To give the GPS system database of dealerships some credit it did find Valley HD and Neidengard’s HD with no issue. This is a brand new 2014 Ultra Limited with the most current software load. To only find 2 out of 5 dealerships listed in the database is poor quality control at best and plain stupid at worst. I am going to do a more in-depth review of the bike as soon as I have the first service completed. The ride back home was completely uneventful until we reached the merge of I68 and I70. I think the highest speed we reached between the merge and I81 was 45 MPH and that lasted about 30 seconds. When we reached I81 I headed south until we reached Martinsburg, WV and then hit the back roads home. Normally that would have been a longer ride, but I bet we saved an hour of scraping my boots along the road. We road nearly 890 miles through 5 states (Virginia, Maryland, West Virginia, Pennsylvania, and Ohio) on a comfortable bike. Our “storm chaser” powers were never activated, which means we stayed dry. As you can see in the pictures, we crossed some cool bridges! We both like pro football (although Debbie is a Dallas Cowboy fan) and the HoF was worth the trip, highly recommended. All in all it was a great weekend away. Ok, so I have issues with selfies. That is a leg cast of Leonard Davis 6’6″ 335 pound Guard! Boom, chicka chicka wow wow! At home in the garage.